Electricity is everywhere, no business can operate without it. Electric companies often take advantage by raising prices or ignoring customer needs. For many years this was just accepted because there just wasn’t any other way, considering how many electrical companies dominate their markets. Now the field of renewable and solar energy systems is growing every day, making a renewable energy system one of the smartest long term investments we can make. Many people are finding freedom from high utility prices in renewable energy systems, like solar panels. Installing solar panels allows you to harness energy from the sun’s UV rays, rather than paying a local utility. As a result, customers often find their long-term return on investment on solar panels is very high. The money saved on energy bills frequently exceeds the initial cost of installation to a point of paying for them multiple times over. Some consumers are even able to sell energy back to utility companies and turn a profit, all while doing their part in creating a greener future. NTS Electric offers full service installations of solar energy systems for both commercial and residential buildings. With over 30 years combined experience in electrical installation and maintenance, you can rest assured that your system is installed safely and professionally. When you’re ready to invest in a smarter renewable energy system, NTS Electric is here to help. Our staff is knowledgeable to guide you through the process and fully trained to ensure your system is installed properly. 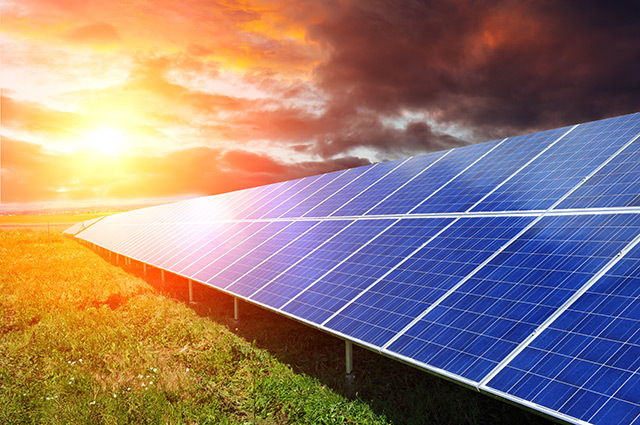 Whether you’re looking for a full solar system to power your business independently or just want your house to be a little more “green”, NTS electric has the skills and knowledge to find the best solution for you. Call today and find out how a solar system can benefit you.